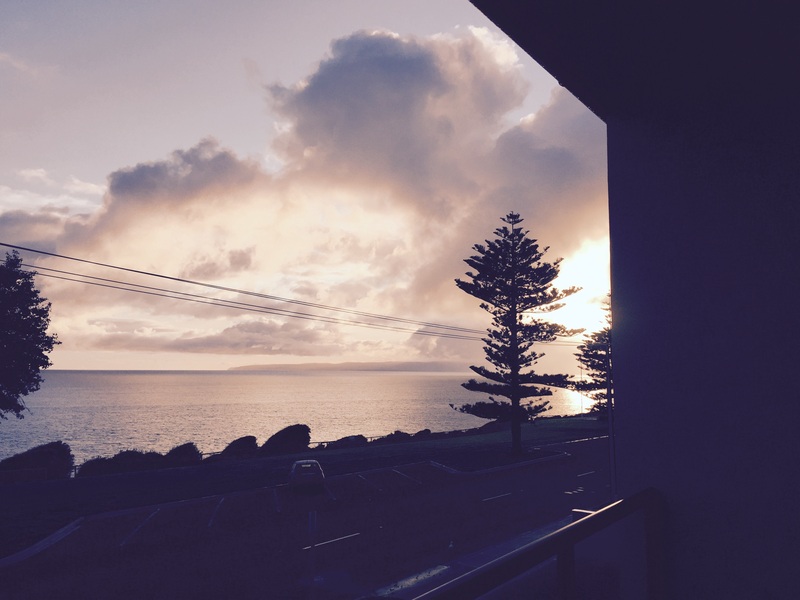 It was a slightly watery sun that lit up the ocean outside our room – the first sign of rain we have had since our arrival in Australia all those years ago!! After a very nice breakfast served by a lady who looked slightly unhappy to be up so early on a Sunday morning, young Glen arrived and we were soon bouncing along the road to pick Louise up. 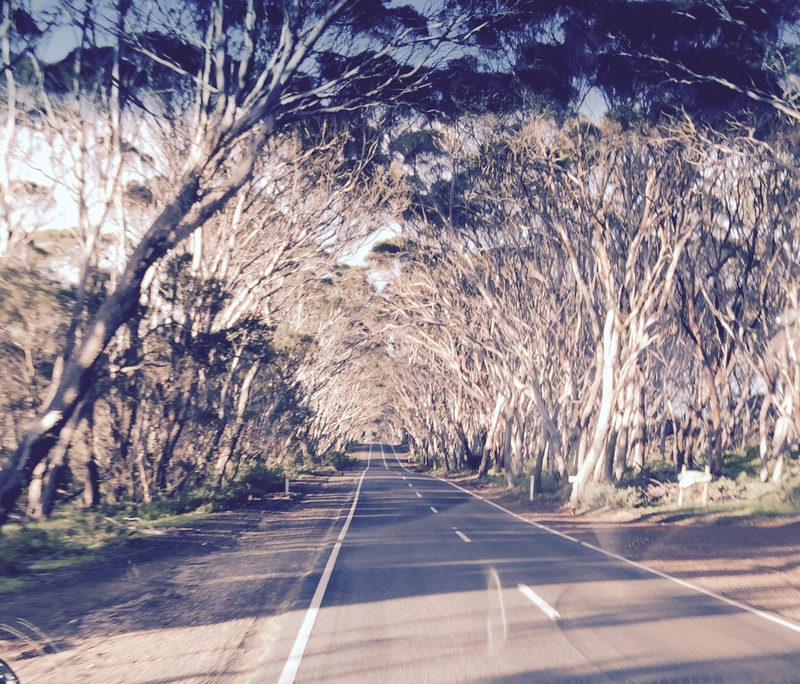 We travelled through a beautiful avenue of trees silver barked trees that were lined up like a guard of honour either side of the road with their branches meeting in the middle. It was lovely. We were then out on the coastal road with the ocean beside us. Louise on board. 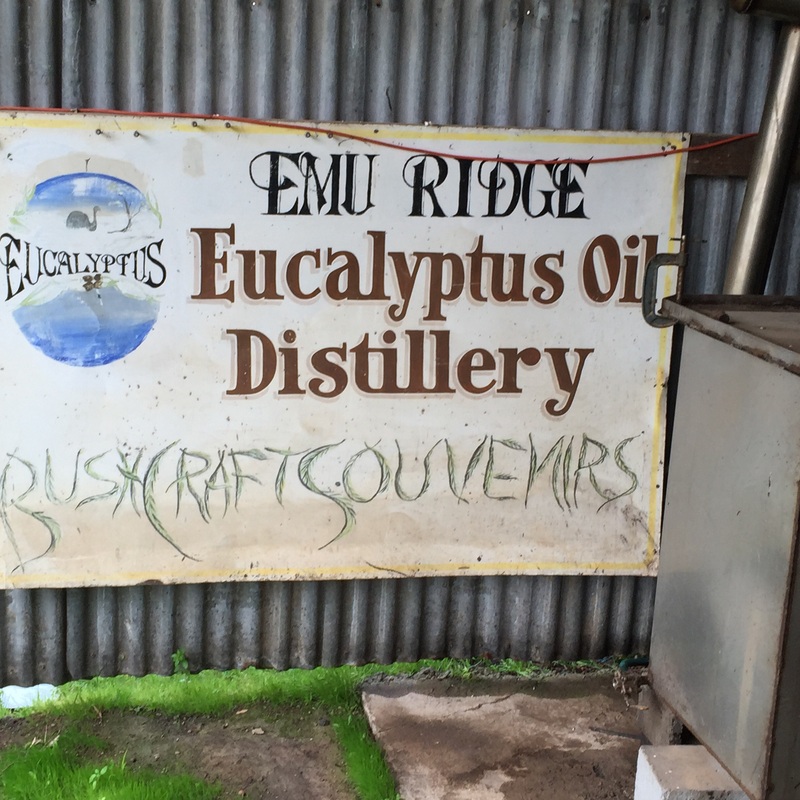 our first stop was at the Emu Ridge Eucalyptus Oil Distillery owned and run by a real character called Larry Turner and his wife Bev. We were warned that Larry came with something of a Government Health Warning! He was great fun. 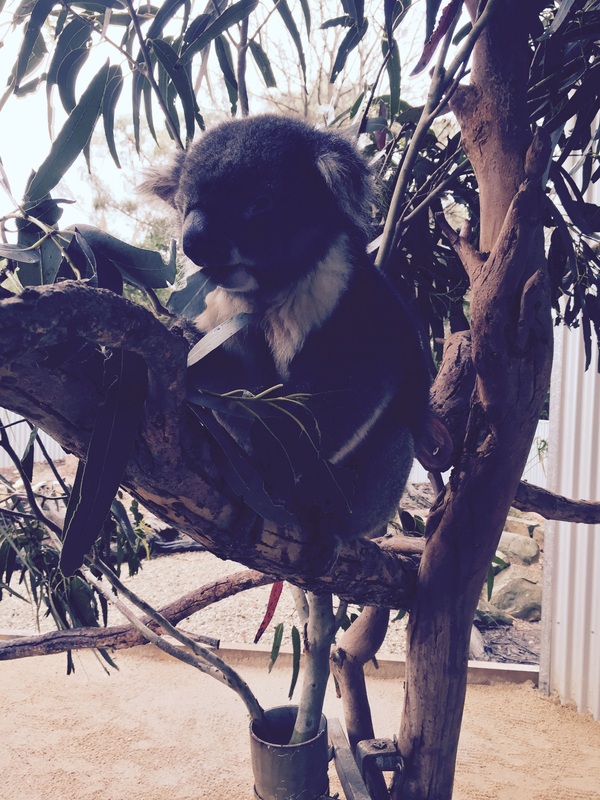 A real down to earth Australian running what is the last Eucalyptus still left on the island. In a few minutes we were treated to his view of his fellow councillors at a recent parliament meeting. He has just been elected councillor for Kangaroo Island. He took us through the distilling process which basically seemed to involve setting fire to the green eucalyptus leaves and then capturing the vapour and cooling it until it becomes liquid. ‘Poisons factory’ something that makes Larry quite proud, particularly as he has set up a bar in the shop where he sells his eucalyptus oil products. The shop was a treasure trove of all sorts as well as the eucalyptus oil and its associated uses. 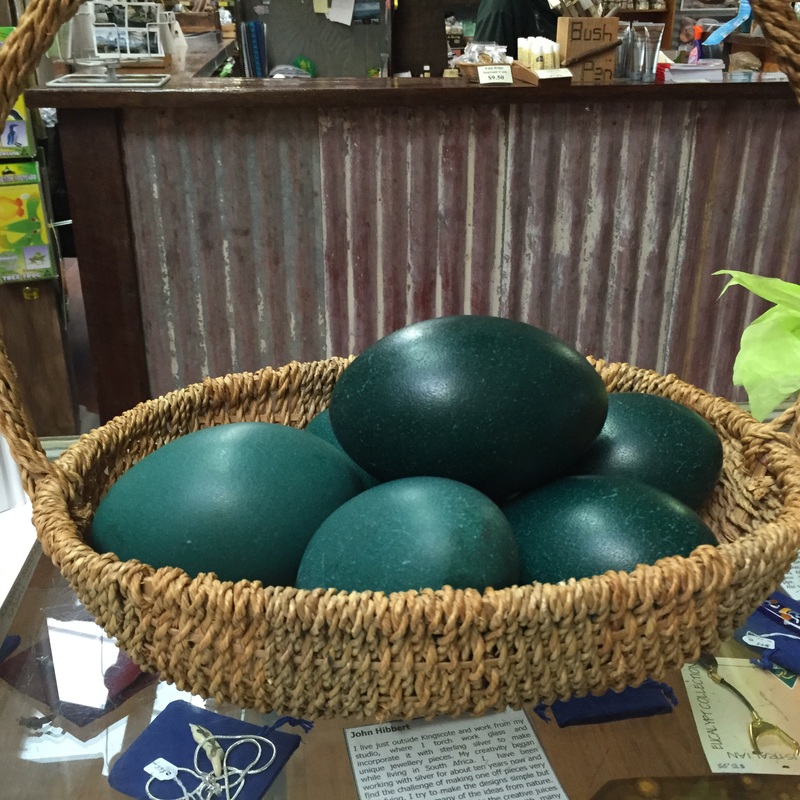 These included emus eggs and – at the bar- cider made by a chum of his down the road. 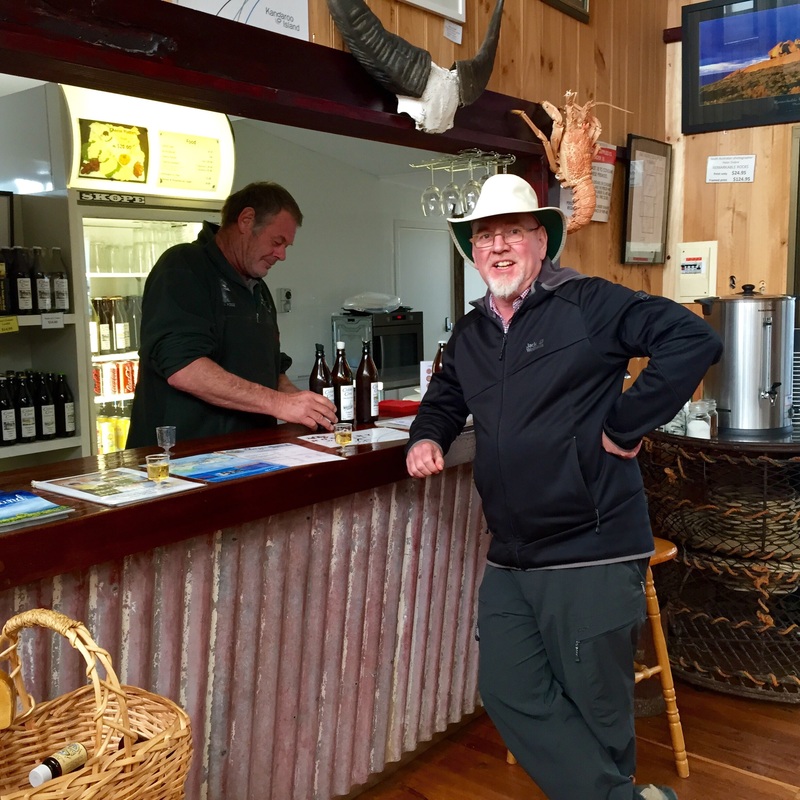 My readers will not be surprised to learn that the Gregory’s could, therefore be seen to be sampling the brew – and it was not yet 9.00 am! It’s a slippery slope! It was actually quite good so we left the place armed with this and other eucalyptus booty. As a side line Larry was also putting the roof over a patio area he had built some time ago for his daughter’s wedding. If I tell you that the area to be covered was in excess of the area of a small church hall, it was only half covered and they were holding a function for 200 netball players the following week. ….. You probably get the feel for Larry. He was confident he would either finish it or throw a ‘tarp’ over the remainder as he wanted to apply him self to finding some spare men to sharpen up the gathering …….. His wife looked set to do murders when we left……. Having left Larry and Bev to ‘have a few words’ as Glen described it, we headed off to a small animal sanctuary to meet a few rescued kangaroos and kualas. The Kangaroos were much smaller than I envisaged and very tame. My favourites though we’re the kualas who seemed to be munching their way to paradise! Lunch was at a wooden lodge village where a very nice chap from Reading served a very jolly lunch. All the others had squid, I held off. Then it was on to explore the very heavily wooded area of native vegetation called the Flinders National Park. Mr Flinders – him of the mountain range – was the first recorded white man to visit Kangaroo Island and gave his name to a number of things. It made one realise what it must have been like to clear the land for farming with no mechanical equipment to dig out the roots of the trees. Live must have been tough where some of those earlier settlers came from to ,ake this a better option. By now the weather was quite dark and brooding and the cloud layer really thick. At the end of the national park we came to a promontory which housed the Remarkable Rocks. This is a ver interesting rock formation – whose title I feel dams it by faint praise. Had they run out of superlatives or what. 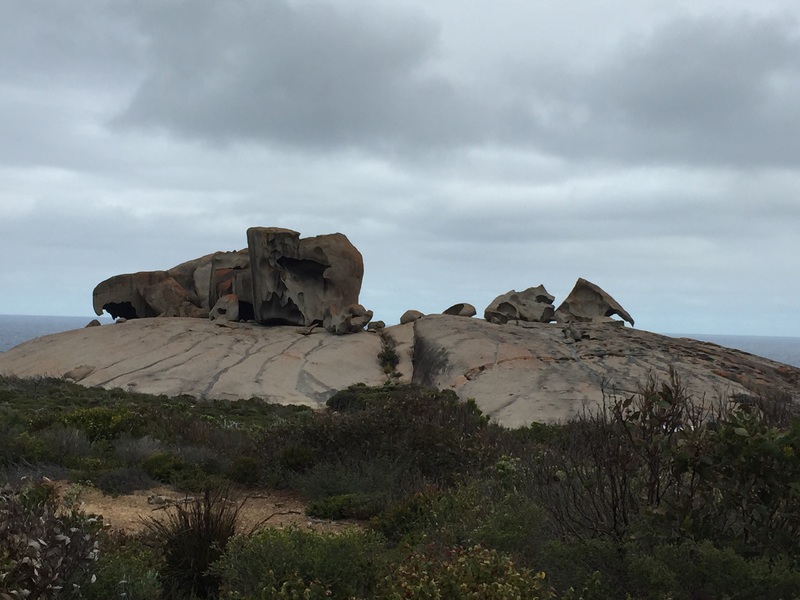 Remarkable Rocks indeed……..! Having been almost blown to bits and shivering at the Remarkable Rocks we were pleased to get back into the minibus and the warmth. However, Glen was not finished with the fresh air treatment! Within a very short space of time we came to another cliff top venue, this time with a walkway taking us down and down towards the sea. First we came to the site of two major shipwrecks where those who survived the wreck, expired trying to get through the undergrowth. – a cheery thought. Waves crashed against the rocks below us as the wind blew into our faces. Still Glen herded us on. Down and down we continued until we took a turn on the wooden walk way and the wind had stopped and we looked out through the overhand of rock onto the ocean. We had reached Admirals Rock. An amazing site which we had to admit was worth the battle with the wind and cold to get there. A smart walk back up the walkway to the mini bus and the coffee and chocolate drinkers were rewarded with their favourite beverage at the Cultural Centre. This had some really interesting displays – particularly trying to address the issue of what had happened to the indigenous population of the island. The question was posed but not answered. No-one knows. There is evidence of them 2,500 years ago but nothing later. One of life’s mysteries. By now we were at the furthest location on the island from the ferry terminal do we started the return trip. 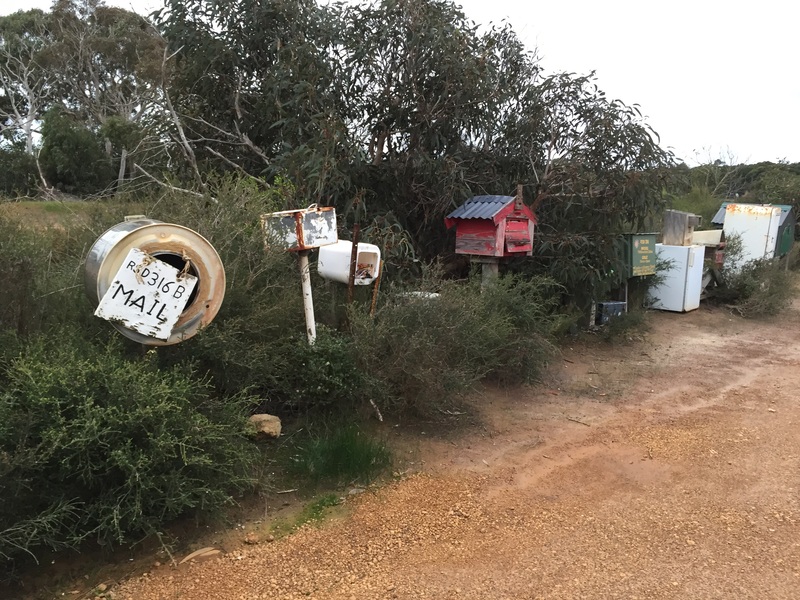 One of the highlights of the route were the mail boxes. These comprised of anything that would safely hold mail and keep it dry for collection. All sorts of containers were on display. From rusting ‘fridges a d microwaves to sawn off oil cans and plastic containers. Fascinating! We eventually arrived back at Penneshaw in the dark at about 6.45. The wind was really string and we joined the huddle of people in the warm waiting area. We could see the lights of the ferry as it ,are its way across from the mainland. At 7.30 we were all on board and started on the return journey. The water was quite rough and the ferry pitched a bit as it churned its way through to the mainland. . Probably best not to have the views of daylight at this stage! Adelaide reached we were all directed to the appropriate bus to take us back to our location in the city. Sadly in the confusion our parting from Louise was rather sudden and I felt somewhat bereft that we had lost our travelling companion quickly even if she had talked of her parents as being in their dotage and it subsequently transpired they were younger than me. Sniff! The dark trip home seemed to take an age before Hindley Road was reached, but it had been a really enjoyable weekend and we arrived back feeling we knew much more about the pioneers of Australia. Tomorrow we leave Adelaide City for the Hills.